Over the last few months there has been a surfeit of talk in the international community over what should be done for Haiti. However, in almost all of these discussions Haiti’s historical context is completely excised – it is almost as if the country had only come into being as a result of January’s earthquake. This collective amnesia is damning. The hurricanes of 2008 and the recent earthquake brought unfathomable damage upon Haiti, but their effects have been greatly exacerbated by Haiti’s widespread poverty, lack of adequate public infrastructure, food insecurity and an utterly bleak horizon. Unlike the hurricanes and earthquake, these are not natural phenomena. The devastating nature of these natural disasters cannot be understood apart from over two centuries of Haiti’s colonial and postcolonial subjugation, foreign occupation, economic exploitation and the degrading conditions faced by most of its population. If one chooses wisely (and not selectively), one can learn from Haiti’s history in order to assure that this cycle of oppression, destitution, and destruction is not repeated. As a first step, providing Haiti with unconditional disaster relief on an urgent basis remains critical. However, so long as the developed countries that played such a significant role in creating Haiti’s present ruinous political and economic conditions continue to ignore and evade their responsibility for Haiti’s impoverishment, the country will remain vulnerable. Recognition of and restitution for past wrongs, coupled with an authentic commitment to end the sabotage and exploitation of this tortured nation, would be the best way to help Haiti achieve the stability and freedom to determine its own future. Regrettably, such a recognition rarely can be found in the mainstream reporting on Haiti’s situation. In the words of Noam Chomsky, “the facts are extensively documented, appalling, and shameful. And they are deemed irrelevant for the usual reasons: they do not conform to the required self-image, and so are efficiently dispatched deep into the memory hole…” However, if we are to talk in good faith about what must be done for Haiti, we must first confront what we already have rendered there. The Spanish were the first Europeans to land on present day Haiti, arriving in 1492 on Christopher Columbus’ first voyage. Columbus named the island La Española, from which the Latinized Hispaniola was derived. At that time, there were an estimated one million Taínos living there and on the surrounding islands. Columbus launched a devastating military campaign against the indigenous peoples, and within a few decades the Taínos population had been utterly decimated, scarcely numbering in the thousands. Diseases such as smallpox, forced labor in the mines and fields and tributes of gold demanded by the Spaniards took a fearful toll on the indigenous population. The French did not arrive to Haiti until 1625. They eventually were ceded the western third by the Spanish in 1697, upon the signing of the Treaty of Ryswick, which ended the Nine Years’ War waged between the two colonial rivals. The result was a divided Hispaniola consisting of the separate colonies of Santo Domingo and Saint-Domingue. French Saint-Domingue quickly became the most profitable colonial possession in the world. This wealth, though, was only made possible by the forced labor of more than 800,000 slaves brought from Africa in chains to work on giant sugar and coffee plantations. At the time of the American Revolution, Saint-Domingue was estimated to be more profitable than all thirteen American colonies combined. During the French Revolution, the colony was the world’s leading source of coffee, produced roughly 75% of the world’s sugar and supplied about two-thirds of Europe’s tropical produce. This lavish productivity came at a terrible price. Conditions on Saint-Domingue’s plantations were especially harsh, and the white slave-owners, who were outnumbered by slaves at least by 10 to 1, resorted to spectacular cruelty and violence to keep their slaves tractable. The environment eventually became so intolerable that a slave rebellion erupted in 1791. After 13 years of struggle, gens de couleur and affranchis under the leadership of Toussaint L’Ouverture and Jean-Jacques Dessalines liberated Saint-Domingue from the French, thus establishing Haiti as the first free black republic in modern history. As opposed to the rhetorical notions of liberty of nations such as France and the United States, both of which still tolerated slavery at the time, “Only in Haiti was the declaration of human freedom universally consistent,” writes Peter Hallward. “Only in Haiti was this declaration sustained at all costs, in direct opposition to the social order and economic logic of the day. Only in Haiti were the consequences of this declaration – the end of slavery, of colonialism, of racial inequality – upheld in terms that directly embraced the world as a whole.” Indeed, as Paul Farmer points out, Haiti “declared itself a haven not only for all runaway slaves but also for indigenous people,” though few were to be found after the French-led genocide. In response to their defeat and subsequent expulsion, the French placed an embargo on Haiti, fearful that its successful fight for independence might encourage slaves elsewhere to demand their freedom. Almost all of the world’s powers shared this apprehension, including the United States, which sided with France and refused to recognize Haiti’s independence. As a Senator from South Carolina explained it at the time, “Our policy with regard to Haiti is plain. We never can acknowledge her independence… the peace and safety of a large portion of our union forbids us even to discuss it.” Similarly, in a letter to then-Secretary of State James Madison, French Foreign Minister Charles Talleyrand decried Haiti as “a horrible spectacle for all white nations.” The embargo, supported by the United States, remained in place until 1825. Given that virtually all of Haiti’s economy was based on the export of tropical produce and sugar, the embargo was utterly crippling. Strangled by the embargo imposed by France and the U.S. and under the threat of military invasion, Haiti acquiesced to Paris’ demands for reimbursement for the losses resulting from the Haitian Revolution (demands supported by the United States). From land to the value of the slaves themselves, to the exorbitant sum of 150 million gold francs, France sought reparations. Consider for a moment the severity of these demands in light of the fact that the Louisiana territory, nearly thirty times the size of the entire island of Hispaniola, was sold by the French to Thomas Jefferson for a mere 60 million francs and the cancellation of 18 million francs worth of French debt. In fact, Haiti was a mainstay of Napoleon’s ambitions in the Western hemisphere and the loss of it played a decisive role in the monarch’s decision to relinquish its huge North American territory. Thus Haiti’s slave revolt, won at tremendous cost, actually had the unforeseen consequence of doubling the size of the United States. The U.S. repaid Haiti by supporting the embargo and France’s decades-long extortion of the impoverished island. While the amount Haiti “owed” to France was later reduced to 90 million francs in 1838, it would take the nation the next 122 years to repay the debt, primarily by way of loans from French and other European banks. One third of these loans came from France itself, at a rate of 6% interest. Demands, most recently made by then-President Aristide in 2004, that these funds (estimated by Aristide at $21 billion, adjusted for inflation and with 5% interest) be returned to Haiti were scornfully dismissed at the time by French authorities. Yet Aristide’s estimate may in fact be on the low side – another recent calculation found that if Haiti were to charge 7.5% interest, France would owe $4 trillion today. Considering the fact that the embargo and subsequent extortion permanently submerged Haiti’s previously profitable economy, leaving the nation under a dark and suffocating economic shadow that persists to this day, perhaps this is not an unreasonable rate. 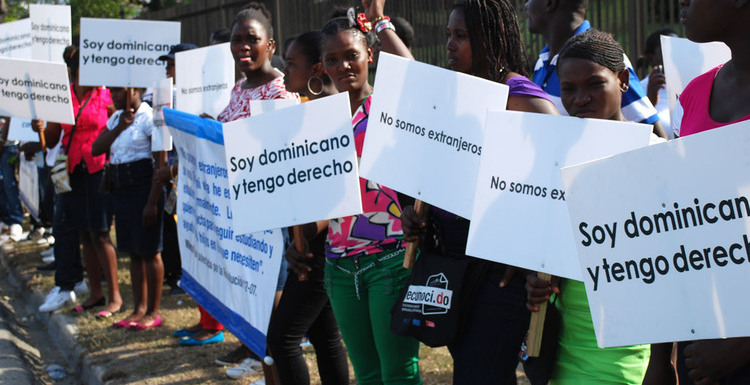 The story of 20th century Haiti will be sadly familiar for students of Latin American history. It took the U.S. until 1862 (shortly after the outbreak of its own Civil War) to recognize Haiti’s independence and eventually to appoint Frederick Douglass as Foreign Minister in 1889. But in 1915, the U.S. again rejected Haitian autonomy under the principles of the Monroe Doctrine and Roosevelt Corollary, which were used to justify intervention. At the time, Germany controlled roughly 80% of Haiti’s international trade and was making strong inroads into the nation’s utilities and overall infrastructure, while both France and Britain represented their own interests in the country. Haiti’s proximity to the Windward Passage, which was significant as a shipping route joining the newly completed Panama Canal and the Atlantic Ocean, and the country’s general political and economic instability convinced the U.S. that more active intervention on the island had become a necessity. The U.S. began its occupation by installing the Haitian president of the Senate as head of state in a snap election in August of 1915. Within two months a treaty was signed to legalize the U.S. occupation for the next 20 years. Haiti’s finances and entire government apparatus were placed in U.S. hands. Even its army was disbanded in favor of a 3,000-man marine force under the control of the Secretary of the State. Historians at times have defended the U.S. occupation by citing the construction of infrastructure and public works during this period. While it is true that significant progress was made in these respects, such good works were incidental development and held little long term significance. Progress was accomplished only through the institution of a corvée, requiring the forced labor of those who could not buy their way out of such service. Conditions deteriorated to such a degree that a revolt was undertaken by the Cacos, nationalist peasant militias to be found in the mountainous north, who were opposed to the occupation and the corvée. After an unsuccessful initial attempt to repel the American invaders, the Cacos regrouped and carried on a stronger campaign of resistance in 1918, in which they were led by Charlemagne Masséna Péralte, a former politician and general in the National Army, who had escaped from imprisonment after being apprehended during the original failed revolt. The Cacos, numbering in the thousands, were so successful that they began to establish a parallel government in the northern part of the country, which had remained largely under their control. Eventually, two raids on Port-au-Prince failed, and Péralte was killed after being betrayed by a cunning Haitian spy. Not long after, the same fate befell Péralte’s successor and the insurgency was at an end. The Occupation was always drifting in the absence of any policy in Washington. As far as I know nothing was ever done for the economic rehabilitation of the country, the establishment of schools generally, the development of agriculture, or the development of the capacity of the Haitian people for self-government. The Occupation was a failure and, when I say a failure, I mean the failure of the United States Government. Washington, not Port au Prince, was to blame. Understanding the implications of the U.S. occupation is imperative if one wants to understand the trajectory of 20th century Haiti. Perhaps the greatest legacy of the occupation was the role of the military, which persisted as the central locus of power in Haiti until President Aristide abolished it in 1995. The Haitian military historically functioned as a means of controlling, intimidating, and assuring the obedience of the poor. As Paul Farmer points out, “from its founding during the U.S. occupation until it was demobilized by Aristide, the Haitian army has never known a non-Haitian enemy. Internal enemies, however, it had aplenty.” Haiti remained an authoritarian military-police state from the beginning of the U.S. occupation, through the rule of the U.S.-backed anti-Communist Duvalier dictatorships, until the direct military rule that ended with Aristide’s first election in 1990. The U.S. legacy of military rule is directly related to another anti-democratic legacy: economic intervention. In 1917, Haiti’s legislature was dissolved to prevent the adoption of a Haitian-authored constitution, thus paving the way for a U.S.-drafted document that reversed the prohibition on foreign ownership of land that had been in effect since Dessalines. The new constitution was passed by a public referendum – the final tally an impressive 98,225 to 768. Needless to say, this “decision” opened the door for nearly a century of economic exploitation by the United States. Given that U.S.-championed economic policies benefited only the Haitian elite and foreign businesses and was not backed up by any sort of popular support, this exploitation was accomplished through the usual means: direct military intervention, overt support for dictators, and the covert training, funding, and arming of paramilitary forces. The growing new oligarchy, whose origins date back to the reversal of the ban on foreign ownership of land, found the military to be an excellent incubator for investment. Marine General Smedley Butler, who had dissolved the National Assembly when it refused the U.S.-authored constitution, bragged that he “helped make Haiti and Cuba a decent place for the National City Bank boys to collect revenues in.” And indeed it was – in 1926, a business paper in New York described Haiti as “a marvelous opportunity for American investment . . . the run-of-the-mill Haitian is handy, easily directed, and gives a hard day’s labor for 20 cents, while in Panama the same day’s work cost $3.” While it is true that public infrastructure (such as roads, bridges, and hospitals) and investment made significant strides forward during this period, the new wealth was created on the backs of the poor through the corvée and was concentrated in the elite classes, which were aligned with the military. The symbiotic relationship between the growing oligarchy and the military continued after the official end of the U.S. occupation. For example, the Tonton Macoutes, the roughly 10,000 murderous thugs that reported directly to the Duvaliers, took advantage of the military infrastructure left behind after the Marines exited in 1934. Through the use of terror, the Macoutes assured the obedience of the slums as Jean-Claude Duvalier opened the country for foreign investment by imposing “minimal taxes, a virtual ban on trade unions, the preservation of starvation wages, [and] the removal of any restrictions on the repatriation of profits.” True, private investment soared during this period: in 1967 there were less than 10 foreign firms in Haiti, but by 1990 this number had increased to 300. But a further stake was driven between the plight of the poor and the wealth of the rich by the neoliberal reforms (or as Haitians call them, “death plans”) imposed by the International Monetary Fund, which began to hit the island in the 1970s and were accelerated in the 1980s. GDP per capita dropped from approximately $750 in the ’60s, to just over $600 in 1990, and well under $500 in 1994. Concerned about the “the ‘virus’ effect of successful independent development,” the first Bush administration reacted to Aristide’s election by withdrawing its aid to Port-au-Prince and funding opposition groups – those almost entirely composed of Haiti’s business elites and members of the military, who already were responsible for the torture and death of countless Haitians. After a failed coup in January of 1991, the army, led by General Raoul Cédras, seized power in September. Following the coup, the CIA then played an integral role in creating, funding and arming a vicious paramilitary group, FRAPH (Front for the Advancement and Progress of Haiti), to maintain the ascendency of the junta and eliminate resistance. Framed as a “political balance” to Lavalas and commanded by CIA asset Emmanuel “Toto” Constant, FRAPH brought state terror in the country to new heights (the most infamous example of which was the Raboteau massacre of April 1994), killing thousands of civilians and forcing hundreds of thousands more to flee. Although Constant theoretically is wanted for the death of between 4,000 and 5,000 people and was petitioned by Haitian authorities to be made to return to Haiti, the Department of Justice denied the request on the contrived grounds that he would not receive a fair trial if returned there. Both Presidents Clinton and Bush II have also refused to extradite him “because he would reveal [further] U.S. ties to the murderous junta, it is widely assumed.” While in November of 2000 Constant was convicted for his role in the Raboteau massacre in absentia by a Haitian court, he is currently incarcerated in New York for mortgage fraud. Not satisfied with merely facilitating Aristide’s removal and essentially looking the other way as the junta ruled by terror, the CIA’s Brian Latell went so far as to prepare a completely fabricated intelligence briefing for Senator Jesse Helms, alleging that Aristide had received treatment at a psychiatric hospital in Montreal in 1980. In fact, however, Aristide was in Israel at the time studying Hebrew. This justified the Republican senator to describe Aristide as a “psychopath” and running a vicious smear campaign against him. Although the CIA’s report has been completely discredited (the hospital denied ever treating him), Aristide’s policies must indeed have seemed crazy to Washington. Despite crippling economic interference, outside connivance and plots against his presidency, his accomplishments still managed to include some impressive political feats: greatly expanding access to health care and education for the poor, reducing illiteracy from 85% to 55%, improving the judicial system, dissolving the repressive Haitian military, more than doubling the minimum wage, creating community stores and restaurants to drive down prices and reduce malnutrition, and implementing agricultural reforms to help Haiti’s impoverished farmers. In the wake of the coup against Aristide, the OAS declared an embargo against Haiti’s military rulers. However, Bush announced that he would be making an exception for all U.S. corporations in the country, and in fact under Clinton, trade with the junta greatly increased. Indeed, the Clinton administration knowingly undermined one of the most important aspects of the embargo – the restriction on oil shipments. This was accomplished by secretly authorizing Texaco “to ship oil to the junta, in violation of presidential directives,” even as the CIA was testifying to Congress that the junta “probably will be out of fuel and power very shortly,” and proclaiming that their intelligence efforts were “focused on detecting attempts to circumvent the embargo and monitoring its impact.” In another revealing violation of the embargo, FRAPH was provided significant quantities of weapons from the U.S. through Miami. Even as President Clinton denounced Cédras and his cohorts as “armed thugs,” the U.S. was helping to keep the junta in power. When Cédras later agreed to resign, the U.S. awarded him at least $1 million and even agreed to rent out his three homes in Haiti for him while he was in exile in Panama. The result of this deceptive strategy employed by the Clinton administration was that the U.S. was able to make a show of returning Aristide to power and “restoring democracy” in 1994, while simultaneously compelling him to accept the terms set by Washington for reinstating him. Aristide was forced to adopt a neoliberal economic program which was unpopular among all Haitians but the business elite. The U.S.-backed candidate in the 1990 elections who campaigned on a similar platform won just 14% of the vote, even though the U.S. contributed $36 million to his campaign. The results were typical of such neoliberal reforms: the agricultural sector was decimated by cheap imports of subsidized produce from the U.S. This drove Haitian farmers off their land, created widespread hunger and caused the loss of agricultural autonomy, a problem exacerbated by illegal “dumping” of surplus products from the U.S. Take, for example, rice, cornerstone of the ordinary Haitians diet. Under the Paris Plan, Haiti’s rice tariffs were cut from 35% to 3%. Imports of rice from the U.S., humanitarian donations not withstanding, increased by more than a factor of 30 between 1985 and 2002. By 2005, rice dumping from the U.S. accounted for 75% of all rice in Haiti. Since two-thirds of Haitians relied on farming for their income, such changes were particularly damaging. Many farmers and peasants, driven out of business by these policies, moved to shanty towns in and around Port-au-Prince, where the population exploded from 760,000 in the early 1980s to around 3 million in January of 2010. Haiti was already one of the poorest countries in the world, but the Paris Plan’s corporate-friendly program, which focused on helping “Civil Society” and the “more open, enlightened business class,” exacerbated the situation by placing emphasis on privatization and opening Haiti to market forces, hamstringing Aristide’s efforts to alleviate the country’s poverty. Recently, Clinton admitted that strategy “may have been good for some of my farmers in Arkansas, but it has not worked. It was a mistake.” These policies, which brought on the bargain-based sell-off of subsistence farm plots to large landholders were supported by only a very small percentage of the Haitian population (the same ones who benefited), and would never have been put in place had the removal of Haiti’s democratically elected leader not been an objective of U.S. policy. Yet Chomsky points out that the American press described Clinton’s show of returning Aristide as “‘restoring democracy,’ a prime illustration of how U.S. foreign policy has entered a ‘noble phase’ with a ‘saintly glow. '” A more accurate interpretation of events is that after secretly supporting, or at least doing nothing to prevent the ouster of a democratically elected and immensely popular president, Clinton and his advisers took advantage of the crisis to impose programs of economic architecture friendly to U.S. business interests while capitalizing politically on his return. The interesting thing here is the strange definition of democracy – it seems that helping to amplify the voice and influence of an elite affluent minority to override the clearly expressed wishes of Haiti’s poor majority hardly constitutes “enhancing democracy.” Of course, often, democracy has simply designated that which is in the interest of the United States, so perhaps the deployment of the term here should not be surprising. The Haitian elite, which had received funds from the U.S., adopted the same twisted terminology as used by Washington, eventually forming an opposition coalition called the Democratic Convergence. The DC, a coalition of around 200 political groups united in their opposition to Aristide, who had became the only major candidate in the 2000 elections. Knowing that they would be swapped in a landslide, anti-Aristide politicians sat out the election under the pretense of protesting a few disputed congressional election outcomes. Thus, in November 2000, Aristide was reelected with 92% of the vote under the now institutionalized political party of Fanmi Lavalas. Despite the fact that he was the only major candidate on the ballot, two USAID-commissioned Gallup polls found that the turnout for the election was around 61%, thus validating Aristide’s victory. That same year, George W. Bush, although at first failing to win his reelection, was installed as president of the United States by a conservative Supreme Court. The Bush II administration, together with his team from the days of the Reagan and Bush I presidencies (including Otto Reich, Elliot Abrams, John Negroponte and Roger Noriega), proved to be an even greater foe of Aristide and his populist following than his father’s or even Clinton had been. Not content only to cut off U.S. aid, in 2001, Bush’s team worked to block international aid to Haiti, secretly (and illegally) getting the Inter-American Development Bank to institute a funding freeze. Nevertheless, the IDB continued to require Haiti to pay interest on their loans, even though it would not disburse any new funds. The IDB freeze, combined with the onerous interest payments on the country’s debt, made any investments in public infrastructure by Haiti’s authorities all but impossible. While whatever precious funds Haiti may have had flowed to foreign creditors, there was no budget available for health care, education, or infrastructure – facts which are highly relevant when talking about the impact of the recent earthquake. The IDB funding freeze remained in place until 2004 when, after allowing for the arming and training of anti-Aristide paramilitary forces and countenancing a rebellion led by ex-military man and former police chief Guy Philippe and former FRAPH deputy commander Louis-Jodel Chamblain, the U.S. sent military personnel to scatter Aristide’s privately hired security forces. This was meant to intimidate President Aristide into boarding a chartered plane to fly him to the Central African Republic which was to provide asylum. He was not told where he was being taken until an hour before landing. It should be noted that just before the paramilitary renegades entered Port-au-Prince and were bearing down on a defenseless Aristide, the Haitian president beseeched the Clinton administration for anti-riot gear, a request the White House summarily turned down. The U.S. still denies involvement, but its version of events has been thoroughly discredited by a number of blatant inconsistencies as well as by eyewitness accounts which tell a different story. As a result of the two U.S.-backed coups alone, more than 13,000 Haitians lost their lives. Since Aristide’s removal, most of his administration’s hard-fought accomplishments have been reversed, as President René Préval has become but the latest figure in this drama to turn on his former ally. The January 12th earthquake was an unimaginable tragedy, the consequences of which will plague Haiti for at least a generation. The death toll now has surpassed 230,000, and President Préval has suggested it could reach as high as 300,000. The human destruction overwhelmingly has eclipsed the suffering caused by other more powerful earthquakes, like the one which recently rocked Chile (with a death toll likely to approach under 500 victims), or the 1994 Southern California earthquake of a similar magnitude which killed just 72 people. In an editorial on Haiti (with the unironic subtitle “The U.S. Military Will Provide Relief, as Ever”), the Wall Street Journal recently compared that California quake to the one in Haiti: “The difference is a functioning of a wealth-generating and law-abiding society that can afford, among other things, the expense of proper building codes.” In a perverse way, this piece has some merit. It is true that the utter devastation wrought on Haiti is a direct result of its rank near the bottom of the global South, with its extreme poverty and seemingly eternal lack of political stability. What the Journal fails to address, beyond the entire history of U.S-Haiti relations, is its own clear and direct complicity in this lamentable situation. Outlets like the Wall Street Journal and the New York Times, whose economic allegiances are quite clear, were all along instrumental in twisting reality and manipulating public opinion in the U.S. against Aristide and the bona fide interests of the Haitian people. We must bear in mind the international community’s historical relationship with Haiti when we hear the media describe Haiti as a “failed state.” The implicit (and often explicit) message in such post-earthquake commentaries is often that Haitians lack the capacity to rebuild their own country. For example, after discussing the inefficacy of macro and microdevelopment aid to reduce poverty, David Brooks of the New York Times suggests that perhaps Haitians, by virtue of their natural culture, are simply “progress resistant,” and the U.S. should therefore concentrate on exporting its “culture of achievement.” For those familiar with the country’s history, this argument mixes bad history with a failed memory of how U.S. self-serving policy destroyed Haiti’s rural agricultural economy and deprived Haitians of their political voice. The sad truth is that during the past two hundred years, some of the richest countries in the world have worked to destroy any hope of a politically and economically autonomous Haiti. If the Haitian people were given the opportunity to freely determine their own future, the Haiti of the 21st century might have had a chance to be radically different from its recent past. In the months following the quake, many of the guilty parties – conservative think-tanks like the Heritage Foundation, media outlets such as the Wall Street Journal and the New York Times, as well as ex-Presidents Clinton and Bush II (who apparently had proven his mettle for disaster relief in responding to Hurricane Katrina) – are offering their own visions for how, not to help Haiti rebuild, but how to help rebuild Haiti. Immediately following the earthquake, the Heritage Foundation advised how to use the present opportunity for “reforms” in Haiti: “In addition to providing immediate humanitarian assistance, the U.S. response to the tragic earthquake in Haiti offers opportunities to re-shape Haiti’s long-dysfunctional government and economy as well as to improve the public image of the United States in the region.” The essay was quickly removed, edited, and reposted, as it was perhaps a little too distastefully forward in its avarice, even for Heritage. This idea of pushing through extreme and unpopular, but artfully self-serving, policies after a disaster is, as the Heritage Foundation well knows, not a new strategy. In fact, this model of change is perhaps one of the greatest legacies of University of Chicago Professor Milton Friedman, pioneer of fundamentalist free-market capitalism. In terms of implementing policy, Friedman believed that “only a crisis – actual or perceived – produces real change. When that crisis occurs, the actions that are taken depend on the ideas that are lying around. That, I believe, is our basic function: to develop alternatives to existing policies, to keep them alive and available until the politically impossible becomes politically inevitable.” This has been deemed “disaster capitalism” by Naomi Klein. In other words, “using moments of collective trauma to engage in radical social and economic engineering.” Friedman’s strategy of using settings that are characterized by mass disorganization and confusion to push through radical and unpopular policies has been employed in countries as diverse as Chile under Pinochet, Russia’s transition to a market economy under Boris Yeltsin, and the U.S. invasion and resulting reconstruction of Iraq (to name just a few of a number of examples). Much of the international brainstorming for reconstruction, including the plan ironically offered by UN Special Envoy to Haiti Bill Clinton, has centered around the idea of increasing private investment. But if history has taught us anything (which it apparently may not have in Clinton’s case), it is that promoting economic growth by exploiting the low costs of labor in international markets will do nothing other than further stratify a society that already is starkly divided along class lines and could worsen the plight of Haiti’s poor (if that is even possible). As David Harvey shows conclusively in “A Brief History of Neoliberalism,” in nearly every instance neoliberal policies have resulted in increasingly unequal distributions of wealth and dramatically weakened social programs. More of the same is not an acceptable option for Haiti when its very survival is at stake. The continuation or expansion of neoliberal economic policies will only tee the island up for another disaster. Many of those who suggest encouraging the expansion of private investment as the most effective way to rebuild Haiti barely veils a desire to exploit the disaster for profit in the language of development and economic growth. A less brazen and more socially acceptable approach could begin by advocating a mix of aid and debt forgiveness. Following the earthquake, $1.2 of the roughly $2 billion Haiti still owes to both foreign governments and international institutions was annulled. This is clearly a step in the right direction – toward allowing Haiti the space and opportunity to begin to construct new and authentic economic and political institutions. But it is just a first step, one which should not have required a catastrophe for the international community to take. “Forgiving” the country’s debt sounds quite generous, until one considers the origins of this debt. Almost half of the money Haiti owed was ‘odious debt’ incurred under the Duvalier regime – about $844 million. Some Haitian critics have asked why should the people of Haiti be responsible for the debt of past dictators like the Duvaliers, who were supported by the U.S. for their anti-communist agenda? They forged a welcome environment for foreign business at the expense of the country’s poor majority and employed a ruthless paramilitary police force to terrorize this majority into obedience – hardly a legacy for which Haiti should be held accountable. The Duvaliers and their thugs killed an estimated 60,000 civilians during their rule, while torturing countless others. For this service, it would be quite unseemly for the U.S. to demand payment, with interest. Complementing the annulment of debts, there was almost immediately a tremendous outpouring of donations of aid in the wake of the quake. At the recent UN Donors’ Conference in New York, pledges of $5 billion in short-term aid and $10 billion in long-term aid were made by the international community, which will be allocated by a commission run by former-President Clinton and Haitian Prime Minister Jean-Max Bellerive. Such aid is significant and will certainly help the afflicted Haitian people. But this mode of giving often simultaneously serves to conceal subtle forms of violence. Political philosopher and cultural critic Slavoj Zizek describes the agents of this process as “liberal communists,” those who “give away with one hand what they first took with the other.” People like Bill Clinton and George W. Bush may be two prime examples of these “liberal communists,” and they played key roles in depriving the Haitian people of their political voice and running off with Haiti’s economy in the 1980’s and 1990’s. Both Clinton and Bush helped to maintain Haiti as an excellent incubator for private investment for foreign industries by cultivating low wages and a basically unemployed population, kept in check by the terror of military or paramilitary forces as well as the firepower of the Brazilian-led MINUSTAH forces. Haiti has more NGOs per capita than any other country in the world, with one NGO for every 3,000 Haitians. Some estimate that 75% of the USAID money given to Haiti makes its way back to the United States through NGOs. Meanwhile, less than one cent of every dollar of U.S. disaster aid currently goes directly to the Haitian government. Prime Minister Bellerive, recently expressed his concern that “the NGOs don’t tell us . . . where the money’s coming from or how they’re spending it. Too many people are raising money without any controls, and don’t explain what they’re doing with it.” Of course, one cannot minimize the care that must be taken that such funds given to the central government are not wasted by nepotism, corruption, or cronyism – admittedly no easy task. Critics such as highly regarded Haitian specialist Brian Concannon, director of the Institute for Justice and Democracy in Haiti, have stressed that the Haitian people must be allowed to lead the way for their country’s rehabilitation. If we are genuinely interested in helping the Haitian people, more money must be directed away from the NGOs and towards a legitimate and functioning government and organisations populaires, community based groups established in the 1980s to defend the poor majority from paramilitary violence while at the same time providing basic living necessities and social services. Where the aid money goes and what it is used for makes a huge difference. While only a trifle goes to the Haitian government, a full third of U.S. money earmarked for the relief effort was allocated for defense and security. When the U.S. personnel arrived in Haiti, several days after Venezuela and Cuba were already set up on the ground saving lives and providing assistance, the emphasis they placed on security and military aid at first compromised the distribution of humanitarian aid. Groups like Doctors Without Borders and the UN World Food Program have complained that their shipments of aid were delayed at the airport, even in some cases turned away, because the deployment of U.S. troops took priority over their incoming flights. With so much U.S. money for Haiti being allocated to military funding, “security and defense” have eclipsed what should be the clear focus: importing and distributing humanitarian aid to a desperately needy population. To many critics, the heavy military presence of the U.S. in Haiti and efforts to effectively bypass the Haitian government increasingly appear as the groundwork for a new “death plan.” But the U.S. military presence may be less troubling than what is already starting to follow in its wake. Just as private security contractors profited from disasters in New Orleans and Iraq, these mercenary groups are now salivating at their current prospects in Haiti. The International Peace Operations Association, a security contractor trade association, recently held a trade show in Miami, giving roughly 20 private security companies the opportunity to advertise their services to government representatives, IFIs, NGOs, private companies and other parties involved in the Haiti recovery effort. The modern-day, privatized equivalent of Wilson’s marines, they will no doubt ensure a hospitable environment for future foreign investment. Even if the military presence is not meant to be the hallmark of renewed economic exploitation, the almost single-minded focus on security illustrates that the U.S. perception of Haiti has changed little since the days of William Jennings Bryan. From many accounts in the mainstream media, one would think that since the earthquake, Haiti has become a vicious battleground for thieves, rapists, and murderers. While CNN’s Anderson Cooper described Port-au-Prince as a “frenzy of looting,” FOX News spoke of “small bands of young men and teenagers with machetes,” who “roamed downtown streets and helped themselves to whatever they could find in wrecked homes.” This is an addition to 4,000 escapees from the capital’s main prison. U.S. troops and mercenaries have been sent to Haiti, in large part, to keep order and prevent looting. This emphasis on looting should remind us of the reporting on Hurricane Katrina, where distinctions were often drawn between white families, who were “looking for food,” and black families, who were “looting.” Even if the stories of wide-spread looting in Haiti were true, would that justify the militarization? Should the first priority of the U.S. be securing the private property of businesses from Haiti’s hungry and homeless, those who have already lost everything? The question is entirely hypothetical – the reality of the situation is that, much like in the aftermath of Katrina, most of these reports have little or no basis in reality. The vast majority of Haitians, almost unbelievably, remained calm, even tranquil, in the midst of the utter destruction that surrounded them. A group of reporters and academics recently there to assess conditions wrote that “while the US media has portrayed Haiti as a place of chaos and helplessness, we found just the opposite.” In a week spent there after the earthquake, they encountered no gangs of roving bandits – instead, they found long but orderly lines waiting for food, water, and money transfers, and communities organizing “makeshift roadblocks to protect those sleeping in the streets from cars. In many cases, people stood guard over the sleeping. After dark the most prominent sounds were dogs barking and roosters crowing. We heard no gunshots in the air.” The militarization of aid may reveal as much about our collective perception of the Haitian people as it does about our national priorities. One needn’t belittle the outstanding contributions of aid that have been given in the past months, or malign the good intentions of the millions of Americans who have donated money. But as Richard Kim argued in a recent piece published in The Nation, the dialogue in the international community must shift from discussing charity to demanding justice. Justice for Haiti requires more than debt forgiveness and pledges of aid. It requires the creation of the conditions for self-sufficiency and self-determination rather than further subjugation and exploitation. Rather than only appealing for foreign investment, creating sustainable and equitable growth in Haiti necessitates accomplishments like raising the minimum wage, improving a decimated and woeful natural environment, instituting agricultural policies that support local farmers, and rebuilding and constructing new public infrastructure, including schools, roads, hospitals, public utilities, and housing. If this is to occur, the Haitian people must be allowed to determine their own political future, and to provide the appropriate resources to help them rebuild their own lives – resources owed to them with interest. This is not to say that the U.S. has no role to play in recovery efforts. In fact, Haiti needs help from the U.S. now more than ever. It is estimated that the cost for demolition efforts alone could run as high as $1 billion. Without commitments from the U.S. and the rest of the international community that it will avoid the advent of donor fatigue, the Haitian government will be effectively paralyzed. It cannot face these challenges alone. But the U.S. role in Haiti’s reconstruction must not be the same as it has been in the past – manipulating the political process and depriving Haitians of a voice, using USAID funds to prompt militias and studiously ignoring the use of terror against civilians. Rather, the U.S. must pledge not to interfere in any democratic election in any self-serving way, including through selective funding. Once the Haitian people have chosen a representative in a free and fair election, the U.S., France, Canada, and the U.N. might begin to redress their shoddy treatment in the past and pledge to provide all the direct support that the new government requires to get back on its feet. They must also work with international economic institutions to ensure that no “austerity measures” are imposed on any further development aid to the country. Up until this point, the U.S. has been successful in preventing Haiti from engaging in even an iota of economic and political self-determination. What Washington cannot undo is its former misguided actions which brought great grief to the nation and its people. But by taking responsibility for its part in the disaster, the time may come where Washington can, for once, play a constructive role when it comes to Haiti. Scenarios: What comes next for the U.S. and Haiti? January 20, 2010 COHA Comments Off on Scenarios: What comes next for the U.S. and Haiti?